As an urban explorer who holds a love for urbex photography, I am continually on the lookout for works published by professional photographers. My wife and I often find ourselves at the nearby Indigo/Chapters store as she is an avid bookworm who easily manages to read at least 3-4 novels a month. While she browses I always end up gravitating towards the photography/fine arts section to see what’s new. I then quickly glance through the local interest section which generally has few titles that peak my interest. However, on one of our recent “book dates”, I came across a photography book by George Webber simply called Alberta Book. I must admit that I’ve never heard of Mr Webber but the cover photo certainly caught my attention. The recent shootings that occurred in Saskatchewan and Alberta, by rural property owners, have the urbex community a little on edge. On the 9th of August 2016, 22 year old Colten Boushie was shot to death when he and his friends drove up the driveway of a rural property near Biggar, Saskatchewan. The property owner, Gerald Stanley, confronted the vehicle and its passengers. Events would unfold that would lead to the death of Colten Boushie who was driving the vehicle. In February of this year, Gerald Stanley was found not guilty. Also in February of this year, Edouard Maurice opened fire on trespassers that were rummaging through the family vehicle on his rural property near town of Okotoks, Alberta. The trespassers ran away but 41 year old Ryan Watson was caught when he went to a hospital suffering injuries from being shot. The case is still before the courts. Both Stanley and Maurice have received huge amounts of public support that believe rural property owners have the right to defend themselves. Alberta RCMP acknowledge the difficulties in responding to situations in remote areas adding that in the last 5 years rural crime has risen by 41%. This has often left property owners having to deal with theft and trespassers on their own. So what affect did this on us as rural explorers? This took place in the same type of areas that we explore. I’ll discuss this in a few moments. “I (and others) use the word abandoned as a blanket term, it's just easier that way. It's obvious that not every place I explore is actually abandoned....but what I can guarantee you is that they are all empty, vacant, unused or unoccupied/uninhabited. Just because a place is “empty, vacant, unused or unoccupied” does not always mean it’s abandoned. For example, our rural home was on the real estate market for over a year while we were transferred for work to another province. It may have been vacant and unoccupied, but it certainly was not abandoned. Freaktography was a big influence on my urbex obsession and the Ontario locations he photographs are amazing. But there are places he’ll go that I wouldn’t dream of entering because they would not meet my comfort level of what constitutes abandoned. Locating rural homes to explore is really not that difficult. The Prairie Provinces have an abundance of homes just waiting to be found. The Derelict Harvest team goes “old school” and uses a Backroad Mapbook that we purchased at Canadian Tire. When Mrs DH picks an area to explore, she’ll turn to the page and well basically grid search the area by car and locate any abandoned homes. If we find a home she’ll draw a little house at the location and we’ll move on to the next. That way we know which areas have been searched and the roads we’ve traveled. After so many years of exploring, it’s enjoyable to open up the map book and see the hundreds of homes we have found. Google Earth can be useful, but generally I find that using Google satellite images to locate abandoned homes if not really that reliable as abandoned rural properties tend to be indistinguishable from ones that are currently occupied. I’ve used Google Earth less than a handful of times. Once to plan an alternate route to an abandoned homestead whose driveway was on a very busy, and thus conspicuous, highway. The other was to locate an old above ground mine near Drumheller, Alberta. After having found an old photo of the mine on google, I was able to pinpoint the area on a satellite image based on the shape of the river that was prominent in the picture. I did the same to locate one of our very first finds, “The Murder House”, which can be seen in our galleries on Derelict Harvest.com. Really, that’s all we do. We’ve been pretty successful so far and we rarely go out without finding a home to explore. As a side note, I began naming our discoveries in order to keep track of them. I used to label all my photograph folders by date but soon realized that did nothing to recall a home that was explored. 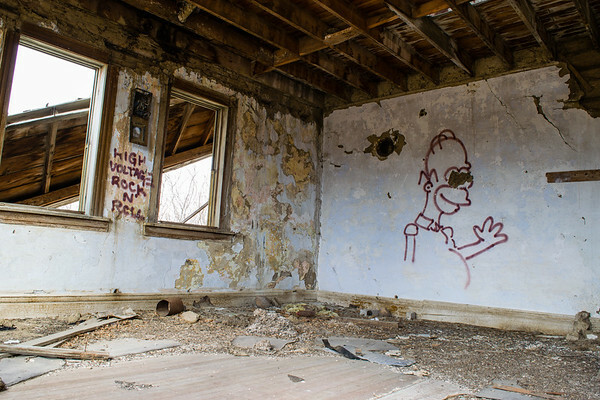 Now every home gets a nickname, like the “Homer” house below, along with the date it was taken. There is a certain criteria in the homes that we choose to explore. Given the circumstance that occurred in Biggar and Okotoks, there is a certain amount of caution that you should take. We’ve always followed the same basic guidelines which minimize the risk of being confronted by an irate land owner. 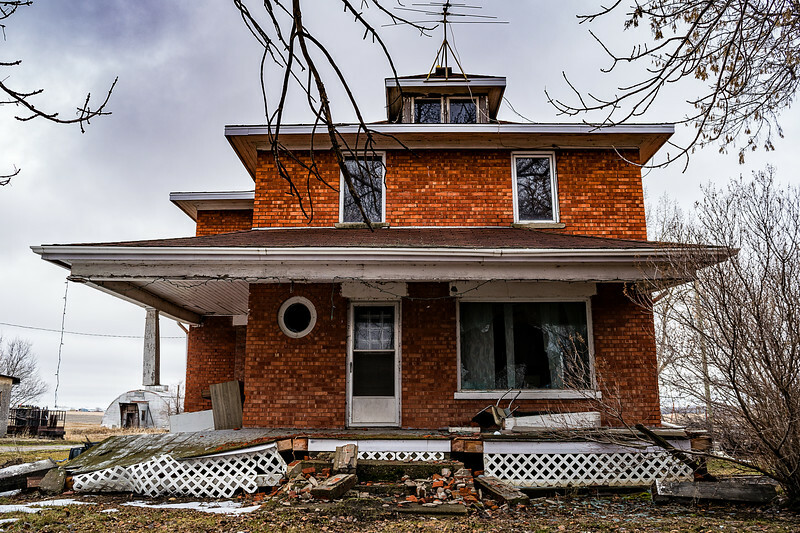 We will not explore an abandoned home that is across or beside a working farm or occupied house. Chances are the abandoned home is owned by whoever resides on the nearby property. It is too suspicious to be that close to an occupied property that has valuable equipment and vehicles on it. Even if there are no homes nearby, we won’t explore a home that has working farm machinery stored on the property. The house may be abandoned, but the owner is keeping farm machinery on the property to work nearby fields. Again, we do not want to be confronted and accused of trying to steal valuable property. As for the house itself, there is sometimes a fine line between an abandoned home and one that simply looks abandoned because of a lack of maintenance. Several times we’ve parked in front of homes and debated whether or not it was actually abandoned. This often occurs with homes that have the stucco exterior that is so common in the prairies. Some pertinent points to look for is whether or not the home still has electrical wiring running to it or whether or not windows are still intact. Keep in mind, we’ve seen homes that are so run down, a few broken windows, debris all over the yard, and no resemblance to a driveway, yet there is a brand new pick-up truck parked beside it. The home is occupied by a homeowner that is just not too concerned about curb appeal! When in doubt, move on to the next. Apart from these things, we explore just about every abandoned home we find. We’ll squeeze through, jump over or go around most fences. The more secluded the home is, the greater probability that a “No Trespass” sign will be ignored. Exception to this rule is when livestock occupies the field where the house sits. That's a "Nope" for me. Even the friendliest looking cow will charge! Do you have any tips that you use when exploring? Comment below and let us know.